Spool art: Vivian Cowher's serger thread angel has a wooden head, stuffed wings and blond curls. Her main wish is that your serger may always stay threaded. 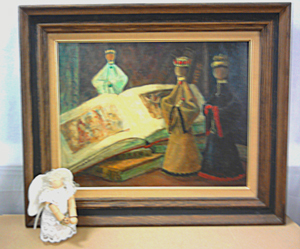 The three wise men were constructed by Jane Marsh with serger cones, scraps of fancy fabrics and jewelry findings, captured in a painting by local artist Charles Percherke. 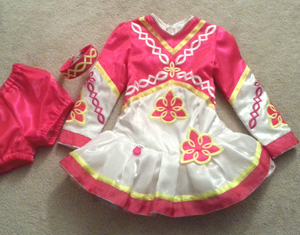 Heather Cobbey made an amazing Irish dance dress for her daughter to wear in competitions. Although there are guidelines for this type of costume, the design is her own. She drew the Celtic motifs and then digitized them in Pfaff 6D Premier software. The large ones for the bodice were stitched on satin in the Grand Dream Hoop (approximately 14 inches square) on her Creative Sensation. Then came lots of assembly with ribbons, appliques, bloomers, and even a headband. Doesn't it make you feel like dancing? 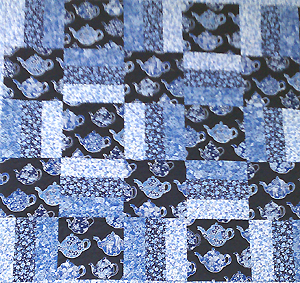 Fussy-cutting puts the teapot print on center stage in this modified triple rail quilt by former employee Patricia Thornton. Just four fabrics, but lots of monochromatic impact. 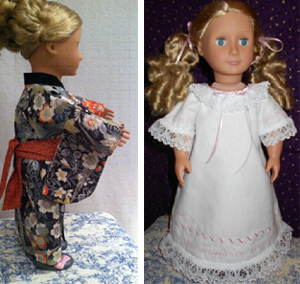 Instructor Julie Kane recently make some doll clothes for an 18" doll. Articles included a Japanese kimono featuring twin needle finishing, a dress with a shirred bodice sewn with elastic thread and a nightgown adorned with decorative stitching. The class filled up without even being advertised, so watch for it to be scheduled again. See more details and read more at Julie's own blog. You can also read her reviews on the table she bought for her Elna 740 and hand look stitches on the Pfaff Expression.